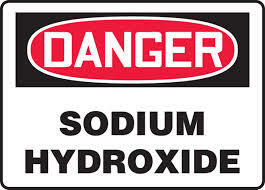 Sodium Hydroxide solutions of 50% concentration will freeze at 58 degrees F. The viscosity increases rapidly as the temperature of the solution falls below 65 degrees F. That makes is difficult or impossible to pump and use. It is necessary to store Sodium Hydroxide 50% solutions in a range between 65 and 85 degrees F. Heat and insulation are usually key factors in making that happen. Our Sodium Hydroxide Storage tanks are very often insulated. 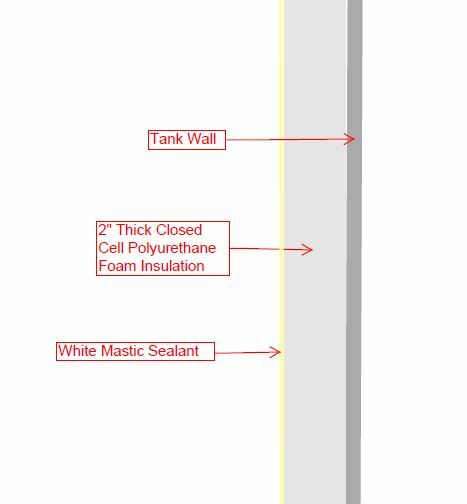 We apply 2" thick closed cell polyurethane foam insulation with an R value of just over 6. The insulation is sealed with a white mastic coating. The mastic coating is a rubbery white paint that stretches as the tank expands or contracts from heating and cooling. The entire outside of the double wall tank has insulation applied to it with the exception of the tank bottom. Fittings such as flanges, couplings and lifting lugs are masked to keep them clear. For Sodium Hydroxide tanks, insulation is usually added in combination with heating panels. The heating panels are known as 'heat tracing'. A digital control panel is part of the heat tracing system. The Heat Tracing/Insulation combination for each tank is calculated to keep the Sodium Hydroxide at a 'maintenance temperature'. We will need to know the zip code where the tank is to be installed so we can calculate the heating requirements based on the record low temperature for that area.